Originally founded in 2012, Snowflake Computing’s mission is to enable Enterprises to become Data Driven. Snowflake is taking the data warehouse space by storm. Snowflake is helping big businesses make their data more readily available for use in the cloud. Companies can quickly upload their data to Snowflake’s secure cloud and plug the data into business intelligence tools like Tableau or Looker to gain valuable insights into customer behavior and sales performance. For Snowflake’s Head of SI Alliances, Uday Keshavdas, and his team, it was clear that Snowflake’s partner program was destined for big things. In 2016, the Snowflake partner team was resource constrained and struggling to keep up with considerable administrative and support requirements. The team needed a technology partner that would allow the business to scale efficiently while enabling team members to focus on core channel priorities like co-selling and joint planning. The coordination of partners and team members, combined with the extensive human to human interaction, limited the potential of Snowflake’s channel team. The team struggled under the weight of voluminous email and telephone communication with partners while performing repetitive tasks, including frequent requests for product and program information. Uday estimates that these tasks were occupying a significant percentage of team members’ time. The team had access to training and sales tools but these resources were not organized optimally and were difficult to locate. Accordingly, these important resources were often underutilized. Deal registration and opportunity sharing had a supporting system but these applications were largely manual, poorly connected with CRM, and were difficult to track and measure . Although partner categories were defined, the Snowflake team recognized that no two partners were exactly the same. Each partner had a unique set of attributes requiring a tailored approach to partner relationship management. Channel business engagement processes, sales enablement resources and training tools also needed to be curated to the needs of each individual partner. In addition to these requirements, the team needed to control access to sensitive resources based upon each partner’s position in Snowflake’s partner program. Given the challenges facing the Snowflake channel program, Uday and his team began evaluating PRM technologies in an effort to build a scalable solution. The team began researching options and conferring with channel thought leaders looking for recommendations on a technology to solve the challenges facing Snowflake’s partner program. Webinfinity was highly recommended to Snowflake by multiple thought leaders who described the Webinfinity platform as a next generation approach to PRM with a strong focus on personalization and digital user experience. After a thorough analysis of top PRM solutions, Snowflake selected Webinfinity as Webinfinity met all of Snowflake’s stringent requirements. After detailed discussions with the Snowflake team about their goals and requirements, Webinfinity began the implementation process. The Webinfinity Client Success team worked closely with Uday’s team to configure workflows that reflected Snowflake’s unique needs. In addition, they made sure that Snowflake’s partner tools and resources were organized and tagged in accordance with Webinfinity’s innovative organizational methodology. This organizational methodology allows each individual user to receive a personalized set of resources curated for the individual’s unique combination of needs at the exact moment the user needs the particular resource. Webinfinity’s platform provided the ability for Snowflake’s partner users to influence their respective partner experiences to reflect the unique individual needs and interests of each partner user. Webinfinity’s Client Success team provided ongoing training and education to Snowflake’s team on best practices for the personalization of partner user experiences. 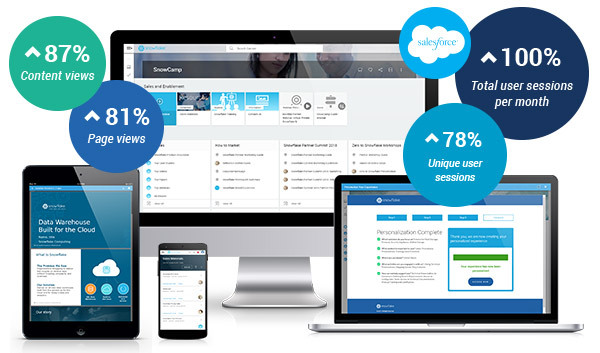 This training allowed Snowflake to fine tune the automation and personalization of their partner portal which contributed to an increase in partner engagement. With Webinfinity, deal registration is more automated and measurable than ever before. “The number of deal registrations jumped immediately once we had Webinfinity up and running. Since then, deal registration has been growing at an amazing rate. We’re literally inundated with deal registrations,” said Jose. “Because Webinfinity integrates so well with Salesforce, it’s very easy to set up automated, integrated workflows in conjunction with not only Salesforce, but other ‘best of breed’ systems, like automating our new partner contracting process through workflows and triggers with Docusign,” said Jose. While the first six months after implementation led to significant KPI growth, the Snowflake team continued to experience exciting growth trends in months six through twelve on the Webinfinity platform. The metrics below reflect the continued KPI growth (over and above the growth during the first six months) from the beginning of month six through the end of month twelve. Ultimately, revenue growth is the most relevant metric and that’s where the results were most impressive. Snowflake experienced a 5x increase in registered deals and through-partner revenue in the year following implementation of Webinfinity’s PRM solution. The evolution towards an even more personalized and unified experience for key user groups is continuing. So as the tech community watches to see just how high Snowflake’s star can climb, Uday and his team feel poised and ready for wherever that ride may take them.